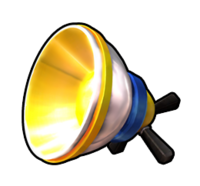 The High Beam is an item in Mario Kart Arcade GP, Mario Kart Arcade GP 2, and Mario Kart Arcade GP DX. Upon being used, the High Beam attaches itself to the front of the user's kart and projects a blinding light for a short time. Any rivals who get caught in the light will lose speed and become blinded briefly as their view turns completely white. This page was last edited on February 23, 2019, at 08:43.